Red velvet is one of my favorite dessert flavors. I especially love it around Valentine’s Day because of the gorgeous red color. It’s perfect for celebrating the holiday in a more subtle way. Granted, I love red velvet in a less subtle way for Valentine’s Day too like in this red velvet chocolate chip cheesecake cheese ball which is so festively decorated for the big day. These white chocolate chip red velvet cookies though are that cheese ball’s less flashy cousin. They are more understated. Maybe even elegant if a cookie can be elegant. But just because these cookies are less flashy than the cheese ball doesn’t mean they are less delicious. They are every bit as good. And let’s talk texture here for a second. 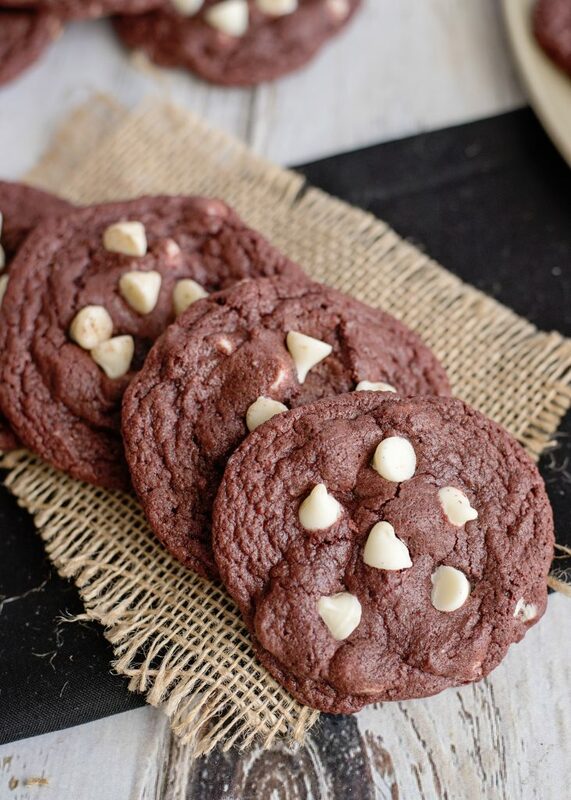 These cookies are perfectly soft and chewy in the center with slightly crisp edges. And the white chocolate chips add to the textures. The white chocolate chips that get sprinkled on the top stay a touch firmer than the ones that get baked with the cookie. 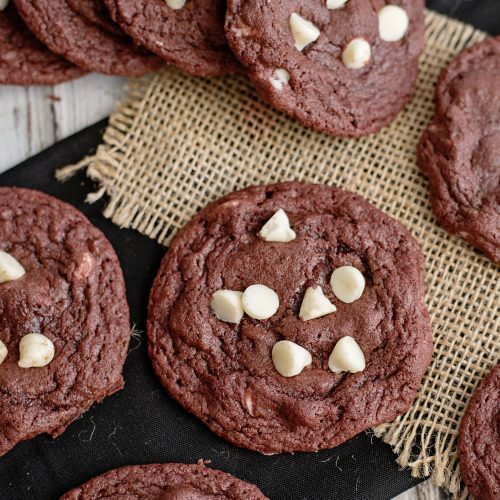 Red velvet intimidates a lot of people, but these cookies are anything but intimidating. 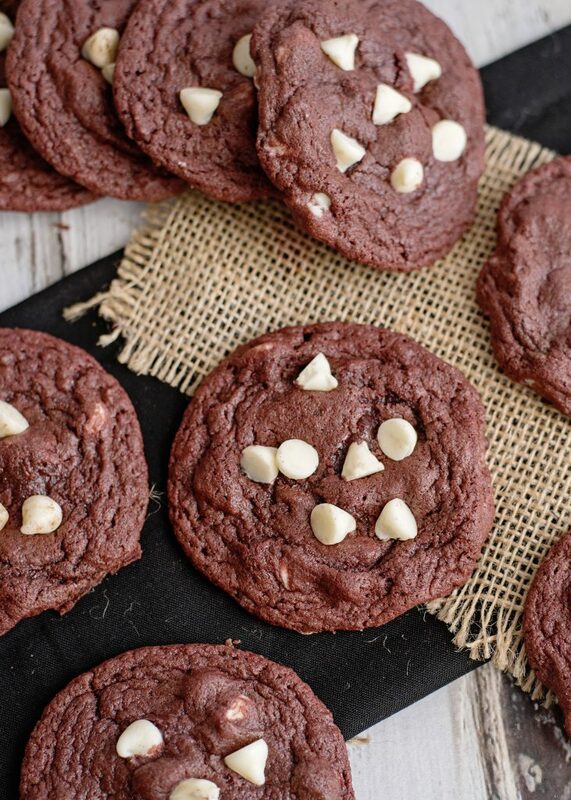 In fact, these cookies have a shortcut ingredient to make them super easy to make. The secret ingredient? Bisquick. Sounds weird but works so well in these cookies, trust me. Bisquick does have all the ingredients you need to make a dough base after all with flour, baking soda, shortening, and salt. 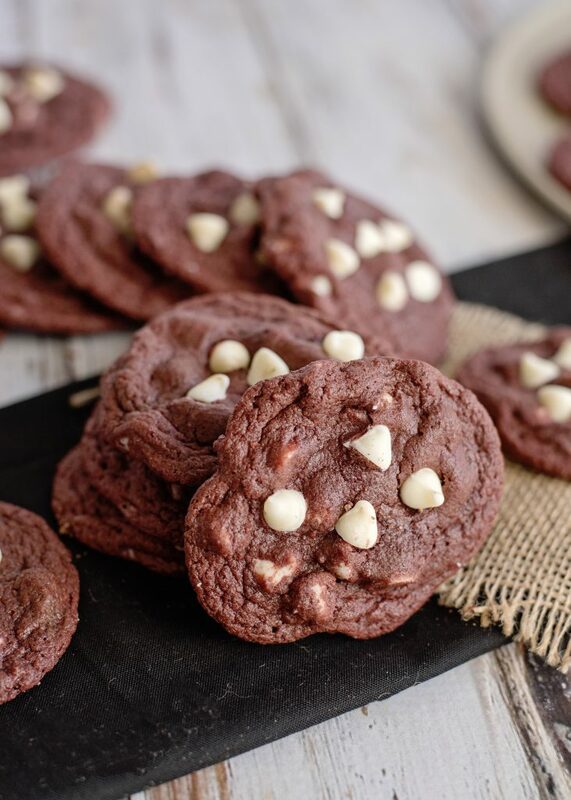 So rather than having to measure those ingredients you just need some butter, vanilla, brown sugar, cocoa powder, food coloring, and of course the white chocolate chips. 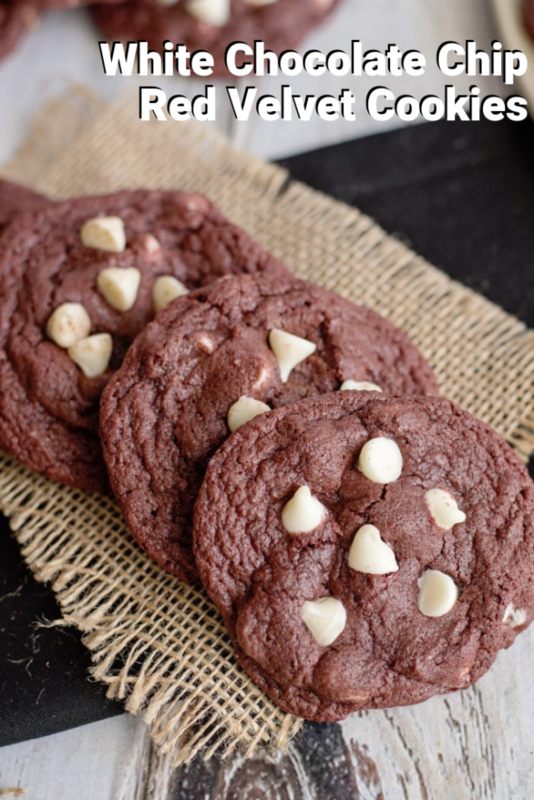 To make these white red velvet chocolate chip cookies, start the way you would with any other cookie by creaming together the butter, sugar, egg, food coloring and vanilla. In a separate bowl whisk together the Bisquick and cocoa powder. Then gradually add into the wet ingredients, mixing until combined. Lastly, fold in 3/4 of the white chocolate chips. 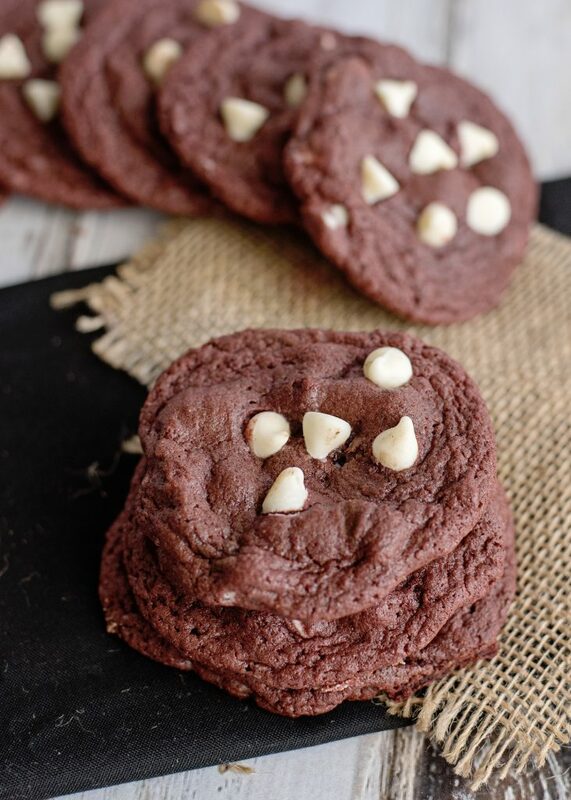 Then the only thing standing between you and red velvety goodness is spooning the cookie dough onto a baking sheet and baking them in a 350 degree oven for 8 to 10 minutes. When they come out of the oven, sprinkle the remaining chips onto the top of the cookies. Then let them cool completely and get ready to enjoy! In a large mixing bowl, cream together the butter and brown sugar until well combined. Mix in the vanilla and egg and then add the bisquick and cocoa. Once mixed, add in your food coloring until the desired color has been reached. Stir in ¾ cup of the white chocolate chips. Using a cookie scoop or tablespoon, drop the cookies onto your baking sheet leaving about 2 inches apart. Bake at 350 degrees for 8-10 minutes. It's important to note that the cookies will NOT look done, they will have a fluffy pancake appearance when coming out of the oven. Mine were done about 9 minutes. I would have never guessed the secret ingredient! 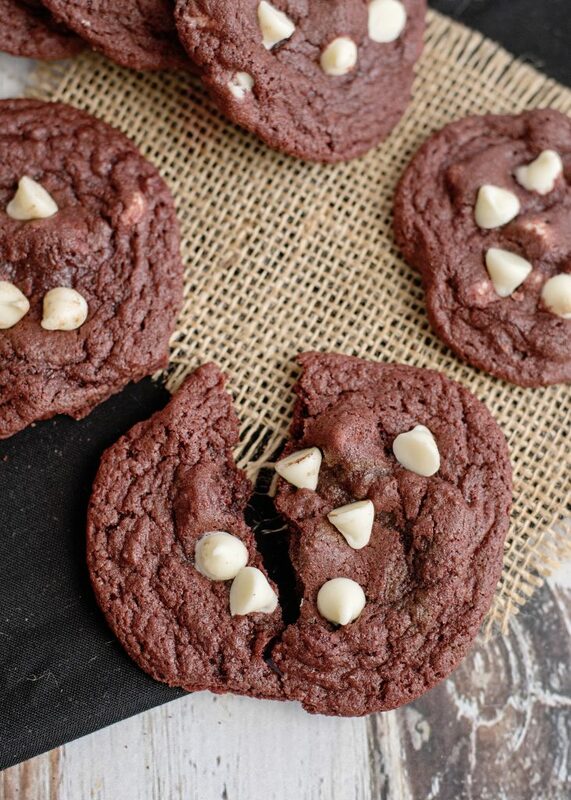 These are indeed perfect for Valentine’s and I can see they have that perfect chewy/crispy texture. I wish I had one RIGHT NOW!